Total ozone levels have been measured at the Halley Bay base of the British Antarctic Survey for more than thirty years beginning in the late 1950s. Seasonal fluctuations were observed for most of that time, and included a thinning of the ozone above the Antarctic during the southern spring, which was considered part of the normal variability of the atmosphere (Schoeberl and Krueger 1986). 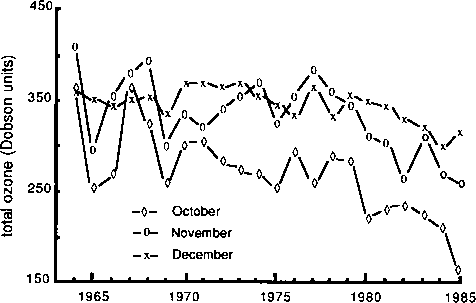 This regular minimum in the total ozone level began to intensify in the early 1980s, however (see Figure 6.6). Farman et al. (1985) reported that it commonly became evident in late August, and got progressively worse until, by mid-October, as much as 40 per cent of the ozone layer above the Antarctic had been destroyed. Usually the hole would fill by November, but during the 1980s it began to persist into December. The intensity of the thinning and its geographical extent were originally established by ground based measurements, and later confirmed by remote sensing from the Nimbus-7 polar orbiting satellite (Stolarski et al. 1986). As was only to be expected after the aerosolspray-can experience in the 1970s, the immediate response was to implicate CFCs. Measurements of CFCs at the South Pole indicating a continuous increase of 5 per cent per year tended to support this, although the original fluctuation had been present before CFCs were released into the atmosphere in any quantity (Schoeberl and Krueger 1986). Other researchers suggested that gases such as NOx (Callis and Natarajan 1986) and the oxides of chlorine (ClOx) and bromine (BrOx) (Crutzen and Arnold 1986) were the culprits. As the investigation of the Antarctic ozone layer intensified, it became clear that the chemistry of the polar stratosphere is particularly complex. Although the stratosphere is very dry, it becomes saturated at the very low temperatures reached during the winter months, and clouds form. Nitric and hydrochloric acid particles in these polar stratospheric clouds enter into a complex series of reactions—involving, for example, denitrification and dehydration—which ultimately lead to the release of chlorine. In the form of ClO it then attacks the ozone (Shine 1988). The evaporation of the polar stratospheric clouds in the spring, as temperatures rise, brings an end to the reactions, and allows the recovery of the ozone layer. (Deshler et al. 1992), and by the presence of chemicals normally associated with heterogeneous chemical reactions at a time when stratospheric temperatures remained too high for polar stratospheric clouds to form. The background sulphate aerosols in the stratosphere provided an alternative surface upon which the reactions took place (Keys et al. 1993). Following the initial identification of the sulphate/ozone relationship in the Antarctic in late 1991, additional evidence was obtained from Thule in Greenland. Measurements taken in the first three months of 1992 showed a negative correlation between aerosol counts and ozone levels in the middle stratosphere, with fluctuations of as much as 50 per cent in ozone content (di Sarra et al. 1992). One year later over Canada, record low ozone values were measured at altitudes at which aerosols from the Mount Pinatubo eruption had been observed (Kerr et al. 1993). When the aerosols from Pinatubo and Hudson initially spread into the Antarctic in 1991, they were unable to penetrate beyond an altitude of 14-15 km because of the presence of the circumpolar vortex. As a result, the thinning of the ozone layer in the upper stratosphere remained close to normal levels. 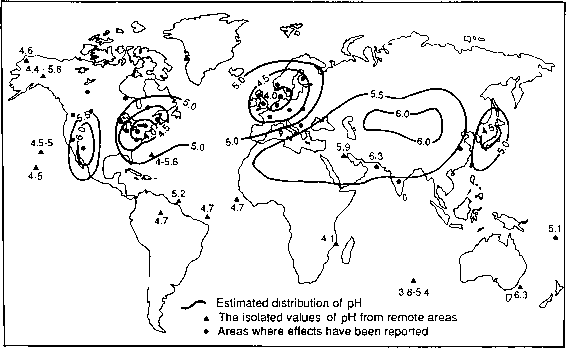 By late 1992, however, the aerosols had spread evenly over the polar region. Record low levels of ozone were reported over the pole and over southern Argentina and Chile, while the thinning of the ozone layer also reached record levels over the northern hemisphere (Gribbin 1992), and global ozone levels were more than 4 per cent below normal (Kiernan 1993). In contrast to these approaches which emphasize the chemistry of the stratosphere, there are the so-called dynamic hypotheses, which seek to explain the variations in ozone levels in terms of circulation patterns in the atmosphere. Certain observations do support this. For example, at the time the ozone level in the hole is at its lowest, a ring of higher concentration develops around the hole at between 40 and 50°S. The hole begins to fill again in November, seemingly at the expense of the zone of higher concentration (Stolarski et al. 1986). Bowman (1986) has suggested that the main mechanism involved is the circumpolar vortex. The Antarctic circumpolar vortex is a particularly tight, self-contained wind system, which is most intense during the southern winter, when it permits little exchange of energy or matter across its boundaries. Thus it prevents any inflow of ozone from lower latitudes, where most of it is produced, allowing the cumulative effects of the catalytic, ozone-destroying chemicals to become much more obvious. The breakdown of the vortex allows the transfer of ozone from lower latitudes to fill the hole. Observations show that when the breakdown of the vortex is late, ozone levels become very low, and when the breakdown is early, the ozone hole is less well-marked. The possibility also exists that the cooling of the atmosphere above the Antarctic, resulting from ozone depletion, will encourage the vortex to persist longer, become more intense and perhaps even spread to lower latitudes, thus compounding the problem (Gribbin 1993). Most authorities tend to place the hypotheses, which attempt to explain the Antarctic ozone levels, into either chemical or dynamic categories (Rosenthal and Wilson 1987), but there are several hypotheses which might be placed in a third group, combining both chemical and dynamic elements. The paper which first drew attention to the increased thinning of the Antarctic ozone layer, for example, might be classed in the chemical group since it attributes the decline to CFCs (Farman et al. 1985). It does, however, have a dynamic element in its consideration of the polar vortex, which appears to be a necessary prerequisite for the ozone depletion. Another hypothesis which combines dynamic and chemical elements is that proposed by Callis and Natarajan (1986). They suggest that the depletion of the ozone in the Antarctic is a natural phenomenon, caused by elevated levels of NOx in the atmosphere during periods of increased solar activity. Sunspot activity did peak at a particularly high level in 1979, and continued into the early 1980s, but measurements by Dr Susan Solomon, released at a special meeting of the Royal Meteorological Society in 1988, indicated that NOx levels in the lower stratosphere in the Antarctic were too low to have the necessary catalytic effect (Shine 1988). Comparison of the situation in Antarctica with that in the Arctic provides indirect support for the role of the circumpolar vortex in the thinning of the ozone layer. The circumpolar vortex in the northern hemisphere is much less intense than its southern counterpart, which may explain, in part at least, the absence of a comparable hole in the ozone over the Arctic (Farman et al. 1985). A smaller, more mobile hole was identified in the ozone above the Arctic in the late 1980s, however, and further investigation set in motion (Shine 1988). The European Arctic Stratospheric Ozone Experiment (EASOE)—involving scientists from the European Community, the United States, Canada, Japan, New Zealand and Russia—was undertaken during the northern winter of 1991-92, using ground measurements, balloons, aircraft and a variety of modelling techniques to establish the nature and extent of ozone depletion over the Arctic (Pyle 1991). Preliminary results tended to confirm the absence of a distinct hole over the Arctic, but noted the higher than average ozone loss in middle latitudes. Because the Arctic stratosphere is generally warmer than its southern counterpart, polar stratospheric clouds are less ready to form, and ozone destruction is less efficient. The less developed Arctic circumpolar vortex also allows the loss of ozone at the pole to be offset to some extent by the influx of ozone from more southerly latitudes. The relatively free flow of air out of the Arctic in the winter might also contribute the peculiar patterns of ozone depletion in the north. Chemicals incapable of destroying ozone because of the lack of energy available during the Arctic winter night become energized when carried south into the sunlight of mid-latitudes, and cause greater thinning there than at the pole (Pyle 1991). By March 1992, the EASOE had detected decreases of 10-20 per cent in Arctic ozone (Concar 1992). Although this was less than the 40 per cent reduction initially predicted, by the middle of the year the Canadian Atmospheric Environment Service had become so concerned about the destruction of ozone in mid-latitudes that it began to include ultraviolet radiation warnings along with its regular weather forecasts, and in March 1993 it announced that the ozone layer above Toronto and Edmonton—at 43°N and 53°N respectively—was thinner than at any time since records began (Environment Canada 1993). There is as yet no one theory which can explain adequately the creation of the Antarctic ozone hole or the thinning of the ozone layer in the northern hemisphere. 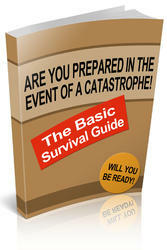 The impact of CFCs is considered the most likely cause by many, however. There can be little doubt that the link between the ozone hole and the CFCs, tenuous as it may have seemed to some scientists, helped to revive environmental concerns and contributed to the speed with which the world's major industrial nations agreed in Montreal in 1987, to take steps to protect the ozone layer.